This paint color has rich plum undertones that shine through this deep red, recalling the stripes of a Colonial flag passed down through generations. Environmentally Friendly, Non-Toxic, Powder Paint! Just Add Water! Real Milk Paint is the ideal choice for an environmentally friendly, non-toxic paint that gives you convenience and a broad color selection. When choosing milk paint always choose products from The Real Milk Paint Company. NOTE: All colors shown both digitally and in print are for representational purposes only. Please test any color in context to ensure it is the color you desire. 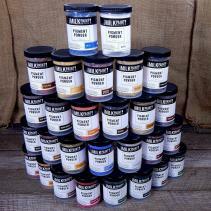 Each Quart contains a bag with 2-1/2 cups of powdered milk paint and a mixing marble. Take lid off can. Remove plastic bag with the powder. We recommend that you only mix a portion of the powder at one time in the can. The powdered paint is mixed 1 part powder to 1 part water. So grab a scoop, around a cup will do. Scoop a cup of powder into the Quart can then a cup of water. Snap on the lid, shake for a few minutes, letting the mixing marble do the mixing. Pop the lids and your ready to paint, it’s that EASY! If too thick, add more water. If too thin add more powdered Real Milk Paint®. If excess foaming occurs, add a few drops of Anti-foam. Surface must be free of contamination, wax, grease, or oils. Clean with T.S.P. Sticks to other paints and finishes with the addition of Ultra Bond. Covers: Sample covers 2 sq. ft. / Pint (16 oz) covers 35 sq. ft. / Quart (32 oz) covers 70 sq. ft. / Gallon covers 280 sq. ft. Note: Real Milk Paint® will stick to oil base clear finishes and some painted surfaces but may cause a chippy , crackle or peel surface. If you want to get full adhesion then adding Ultra Bond is recommend. Please see “How to apply Real Milk Paint® to an Unknown surface” and “How to Paint Walls“. For a brushy old world look use these natural bristle brushes for application. For a smoother more uniform painted look use these Foam Brushes. As days and weeks go by, the non toxic paint will continue to become more resistant to moisture. After it has dried 3-4 hours you may top coat with varnish, oil finish, Pure Tung Oil, lacquer, or wax. Try in inconspicuous area first, the color may change. Wear proper safety equipment, goggles and rubber gloves. To spray, milk paint must be mixed in a blender to a smooth consistency and then strained. A 2.0 orifice or higher for the spray gun is recommended. CAUTION: Contains calcium hydroxide (lime) may burn eyes and skin. Flush and rinse with warm water immediately. Learn more about how to mix milk paint. We believe in being honest with what is in our products. That is why we provide the ingredients used in them so you can rest assured knowing exactly what is in the product you use. It’s just another way we make it easier on you! After it has dried 3-4 hours you may top coat with one of our Finishing Creams, varnish, Hemp Oil, Pure Tung Oil, lacquer, or a wax. Download the Milk Paint SDS here.